Lenovo's IdeaPad Yoga 2 Pro is officially comes out on October 18th 2013, the same date that the new ThinkPad is also set to release. 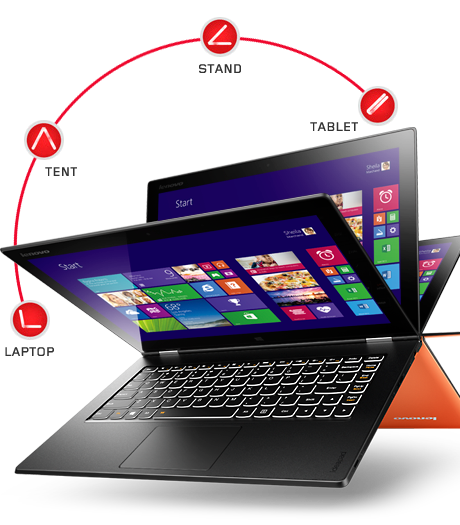 The Lenovo IdeaPad Yoga 2 Pro will be starting at $1,099, buyers get a silver gray variant with a Haswell-based 1.7GHz Core i3 processor, 4GB of RAM and a 128GB solid-state drive. An orange model normally costs $1,399 (currently $1,149), although that also includes a 1.6GHz Core i5, 8GB of RAM and a 256GB SSD, or you can snag a model for as little as $1000 from Best Buy. All models have the same basic convertible tablet design. The Yoga 2 Pro allows the screen to flip around 360 degrees and you can use the Yoga 2 Pro as a touchscreen tablet. The new design is also thinner at .61 inches thick and weighs just over 3 lbs, making them slimmer and lighter than last year’s Yoga convertibles. But the new models also get longer battery life. Lenovo says you should be able to get up to 9 hours of use on a charge. The Lenovo Yoga 2 Pro features a 13-inch multi-touch display with a super-high-resolution QHD+ (3200 x 1800 pixel resolution)10-point multitouch display delivers spectacular visuals, while in-plane switching (IPS) technology assures that images will be crisp across a wide viewing angle. Additional improvements include a new Lenovo Transition system, which automatically locks the keyboard in place when the hinge is flipped 360 degrees into tablet mode. The keyboard has also been upgraded and includes a backlit keyboard for easy use in low light situations. Each model features 802.11n WiFi, Bluetooth 4.0, and Windows 8.1 64-bit software. They have 1 USB 3.0 port, 1 USB 2.0 port, and HDMI output.